SAN FRANCISCO — Just around the corner from the newly expanded San Francisco Museum of Modern Art (SFMOMA) — a veritable temple to wealth amassed in the form of contemporary artworks — the Yerba Buena Center for the Arts (YBCA) has mounted a very different kind of installation, one which monumentalizes activism. 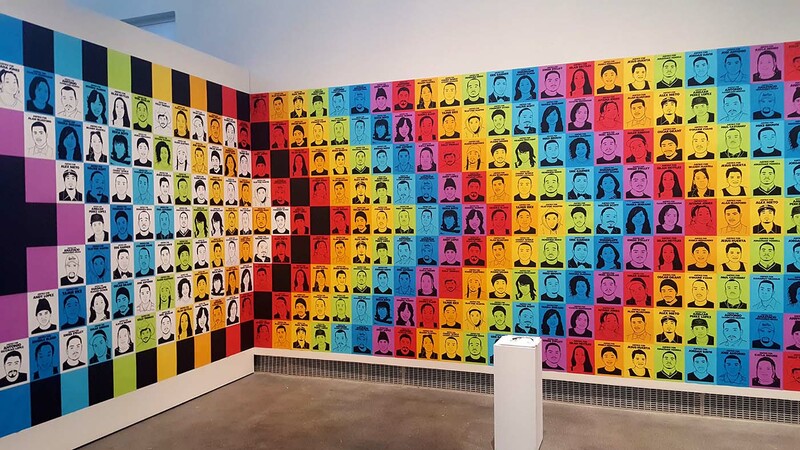 Take This Hammer: Art + Media Activism from the Bay Area highlights artworks that attempt to make visible the crippling inequity of wealth distribution, racial displacement, and growing gap between the moneyed elite and, increasingly, everybody else in the Bay Area. 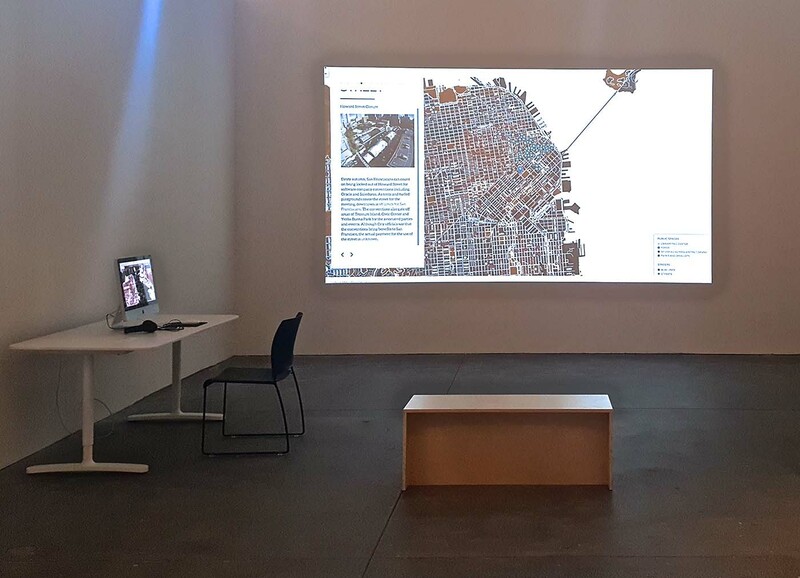 Much of the work on display is data-driven, drawing from the radical disparities arising in the Bay Area due to the disproportionate wealth of tech-based industries. Though the tech bubble, currently in its second wave, is nothing new, San Francisco’s determination to maintain picturesque, low-density housing has led to a severe shortage in affordable living accommodations, sending prices sky-high and driving longstanding and low-income residents out of their homes all throughout the city, the East Bay, and communities to the north and south. This trend is charted by the Anti-Eviction Mapping Project, a San Francisco-based art collective, in “Narrative of Displacement and Resistance.” A website, projected on a wall, reveals the massive population displacement taking place in the Bay Area that’s resulting not only in rampant homelessness — leaving denizens literally strewn on the ground in parks or on sidewalks — but an insidious forcing of low-wage earners farther and farther afield, causing them to endure ever-longer commutes on expensive public transportation simply to access the jobs that barely support their existence. All over the city, “Help Wanted” signs proliferate in the windows of restaurants and coffee shops — even when they pay above scale, these are becoming jobs no one can afford to take. The data-based works are supplemented by a number of pieces chronicling direct-action interventions by a range of Bay Area activist groups. San Francisco may have become generally indolent, but those closest to its history remain rooted in the populist action that made the city a beacon for all kinds of people marginalized and alienated by mainstream society, including LGBTQ populations, immigrants, and radicals. Tech companies are rightfully targeted as the drivers of much development that has left young and aging queer people on the streets, and pushed immigrants from neighborhoods they built, as well as those responsible for the character of the city they’ve occupied for decades. Two performances/interventions by interdisciplinary artist Leslie Dreyer attempt to directly address tone-deaf actions on the part of tech companies: the much-protested private Google buses, which co-opted public resources to form private conveyance for Google employees to their Avalon-like global headquarters in Mountain View; and the recent scourge of Airbnb, which put a cherry on top of its displacement-fueling “sharing economy” with a series of ads last year that had San Franciscans up in arms. 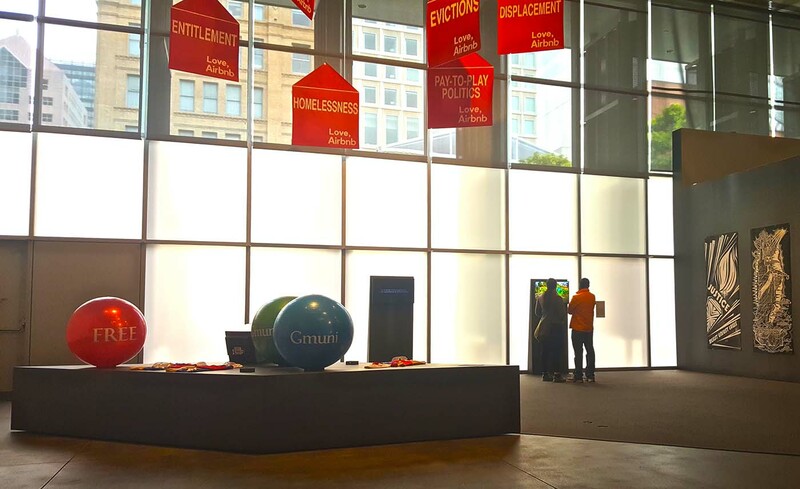 Dreyer organized a human pyramid in front of the Google bus, and staged an occupation of Airbnb headquarters that included the release of balloon-powered banners that mocked the offending campaign, examples of which can be seen floating from the rafters at the YBCA. In another room, “Justice For Our Lives,” a wall of rainbow posters mimic the archaic “Wanted” poster format but spell “Justice Wanted,” collectively visualizing the epidemic of police violence against people of color. Names like Trayvon Martin and Sandra Bland are front and center, but surrounded by hundreds of others who have fallen victim to violent — and often unpunished — hate crimes. 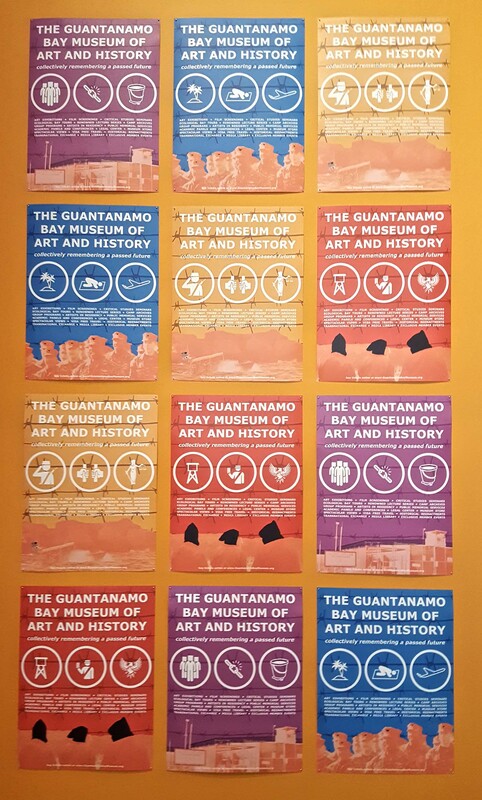 These posters were distributed and visible during the powerful protest on MLK day of 2016, during which the anarchist collective Black.Seed shut down the Bay Bridge with a peaceful and well-organized Black Lives Matter protest that briefly and temporarily halted the flow of gentrifiers into the historically black enclaves within the East Bay. Even the more aesthetically minded pieces are loaded — literally, in the case of “Immersive Data from The Liberator Cycle,” a wall of visualized data that reprints the plans for a 3D printable handgun (of same name) that was released on an open-source platform in 2013 and downloaded 100,000 times in two days before being taken down by the US State Department. The algorithm prints the data with coordinate points displaced along the X, Y, and Z axes according to the handgun homicide rates of 178 different countries. The resulting wall of chaos is a fitting expression of the terror and carnage of gun violence. In other works, the viewer has to search more carefully for the hidden story. 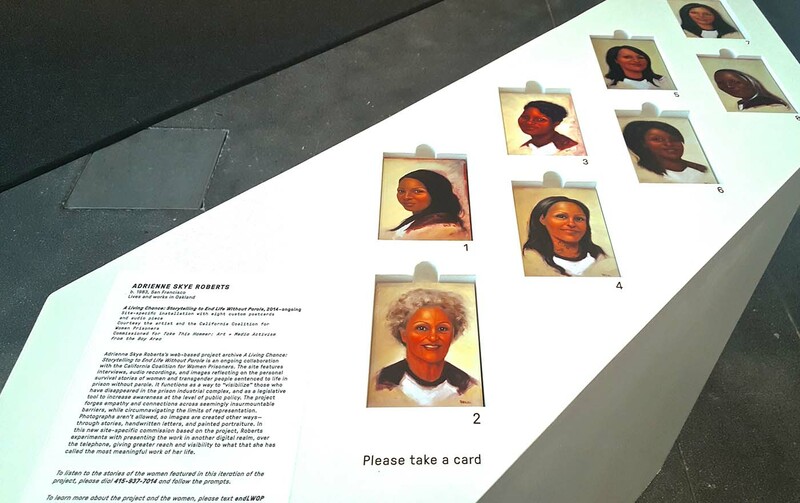 In A Living Chance: Storytelling to End Life Without Parole by Adrienne Skye Roberts, a pedestal offers a selection of beatific portraits of women of color; the backs of the postcards feature stories in the women’s own words about their prison experiences. And a closer look at a wall of colorful posters by design collective Dignidad Rebelde, which greets the viewer at the entrance to the exhibit, finds each containing a graphic message of protest and empowerment: “VIVA LA MUJER,” says one; another calls for a general strike, “Clean Coal is a Dirty Lie.” The wall is gridded with dozens of personal and political messages calling for change. 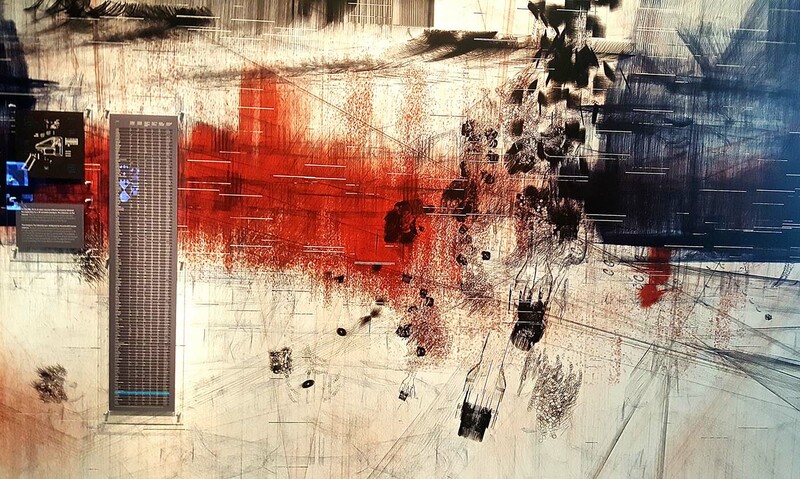 Jeremy Mende, “Immersive Data from The Liberator Cycle” (2016), site-specific mixed-media installation, vinyl wall graphic: 144 × 178 13/16 in. Take This Hammer is full of figurative and literal takeaway — my bag bristles with postcards of incarcerated women, a card with Dreyer’s cheeky “Gmuni Pass,” a poster demanding justice for Aiyana Jones. This is not art you can admire before retiring to sample the new offerings at the renovated SFMOMA roof cafe and sculpture garden — this is bleeding-edge activism, and it represents a struggle for basic freedoms, agency of place, life and death. As the title of the exhibition suggests, we are not simply being presented with works of art — we are being given tools to remake the world. A hammer can build new structures, but it can also be used to smash down those that push us out and keep us confined. 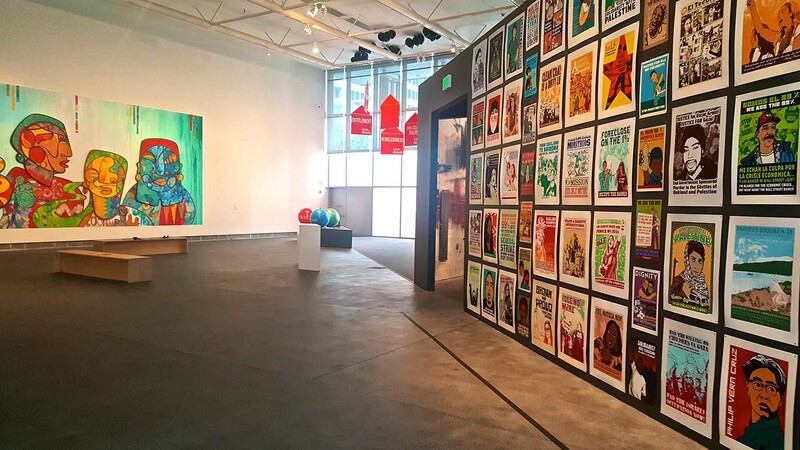 Take This Hammer: Art + Media Activism from the Bay Area continues at the Yerba Buena Center for the Arts (701 Mission St, San Francisco) through August 14.